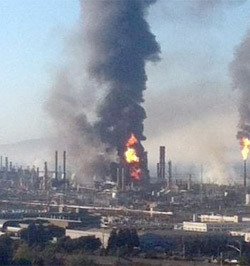 Our own Heather Kulp describes that dramatic August afternoon from the vantage point of the refinery offices. What was the feeling of employees within the plant? What was learned, and by whom? And what steps are being taken to avoid this kind of incident in the future? Jan Brown led us in the pledge today, and Stoney asked the club for a moment of silence for “Peace and freedom on Earth”. Henry Kelman commented on the stock market. Mark Howe brought his daughter to lunch today who was on break from college at Boulder, where it is now legal to smoke marijuana – should I be worried? Mr. Adiago, a friend of Sid’s, was visiting today. Erle Brown, who was still out after his back surgery but doing well, asked us to remember the Crab Feed. The popular event is scheduled for Saturday, Feb. 2nd. Tickets are $40 in advance. Download the flyer and ticket order form. Questions? Contact Erle or Henry Moe. The Club is Dark this Friday. Don’t show up unless you want to eat a bag lunch in your car. The always fantastic Heather Kulp will be our speaker the week after Thanksgiving. Stoney is planning a Christmas Extravaganza with the El Cerrito Club. The event will take place on December 15th, 6:15 PM, at the Richmond Country Club. The cost of $150 per couple. You will be entertained by a terrific dance band, a choir, and a magician. No-host bar. If you’re interested, get you money to David Brown ASAP. Mike Winter has accepted appointment to that most august body, the Board of the Richmond Rotary. We were sorry to learn of the passing of Russ Schulze on November 18th, at Kaiser Hospital in Walnut Creek. Russ was the president of the Richmond Rotary Club in 1969-70. We will post information about the services if it becomes available. Our scribe did not record any Recognitions on this day. Salesian Boy’s and Girl’s Club fund raiser that both he and Stoney attended where the hit 50’s band Poison Ivy played. $10,000 is what the raised for the club. Herb talked about a back surgery that was performed on his son that worked miracles. Joan Davis congratulated Josh Genser on receiving the Barbara Obele Community Service award from the Chamber this week. Nick Despota introduced Eric Aaholm, the Executive Director of Youth Enrichment Strategies, or YES. 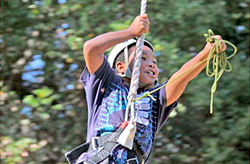 This Richmond organization brings together children, their families and their school communities through camping trips in our regional and state parks. YES also offers workshops in non-defensive communication, PeaceTalk. In addition, they help teenagers obtain internships in local businesses and community organizations. After attending a summer camp, teens may take volunteer positions with local non-profits like Solar Richmond, Urban Tilth and others, which offers the opportunity to accept and develop personal responsibility. YES communication workshops that encourage communication between races, neighbors, and among students which can help to prevent violence from erupting in the community. Eric gave an example of an obese young women who rarely felt comfortable enough to venture far from her home. Thanks to her participation in the YES camp, the young woman gradually gained confidence and a more positive self-image. She has now attended 6 camps and works with Building Blocks for Kids as a volunteer. She now feels involved and part of the community. YES’s most recent events, “Walk to Nature”, offered walking expeditions to nearby East Bay Regional Parks. : Miller Knox Park and Point Pinole. Provisions for the event included watering stations and free food. Chevron is a major contributor. YES does not get any funding from the government. One-third of their funding comes from individuals and the balance comes from foundations. Under Eric’s leadership, the YES budget has grown from $270,000 to $530,000. He greatly appreciates the funding he gets from Richmond Rotary. Over the last few years, our club has contributed approximately $4,000 to YES.